"Superb guitarist and singer...every song's a gem. " "A true triple threat. 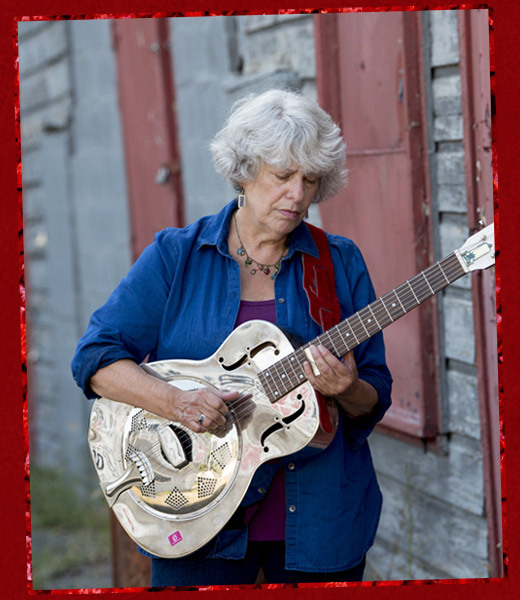 A Songwriter, Vocalist and Slide Guitar Player! "Sh*t man, she can play." 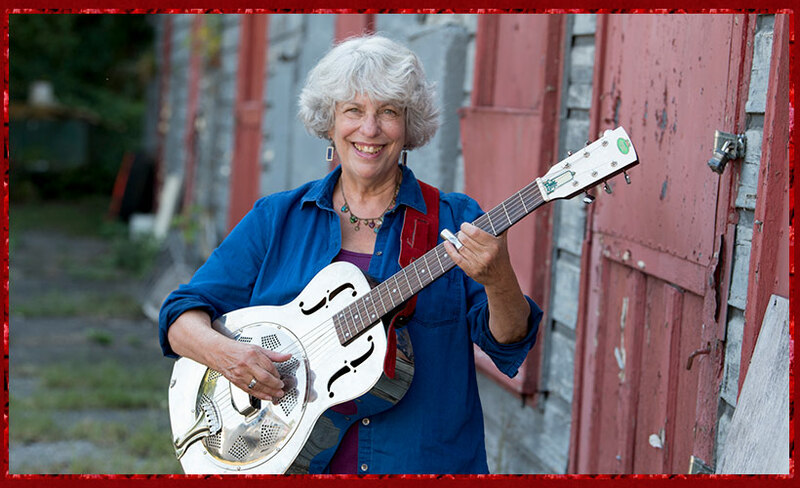 A 2014 inductee into the NY Blues Hall of Fame, Elly Wininger's third and most definitive CD "Little Red Wagon" was #8 on the Folk Music DJ Chart for January 2018. Having played historic NYC venues such as Kenny's Castaways, Dr. Generosity's, Folk City and the Bitter End, Elly now tours and performs nationally and is an annual feature at the Woodstock Invitational Luthier's Showcase. Elly's musical talents, however, don't end there. As producer of a series of music documentaries for Public Radio, "Rockin' the Boat," which chronicles the power of music in movements for social and political change around the world, won several awards, including one from the United Nations. As a composer, Elly's guitar, vocal work and original songs, have been featured in theater productions, video games, and on the Clio award-winning public service campaign against drunk driving called "Friends." Elly also produces albums for other artists and hosts the live variety radio show: "Catskill Cabaradio" on WIOX Roxbury NY. In addition to giving workshops and clinics, Elly has created a program called "Our Song" which has been used by many organizations including the ARC for people with intellectual and developmental disabilities, to assist people in writing their own songs. Harkening back to her start in Greenwich Village, festival promoter Kurt Henry called Elly a "folk-blues legend." And indeed- she played the very first set on opening night at CBGB, and was offered a recording contract with Red Robin Records at age 16. "I saw an ad in the Village Voice that said 'Wanted: Blues Singers,' and since I was studying with David Bromberg and playing the basket houses, I grabbed my guitar and took the subway to the Bronx. After wandering around the projects, I finally found the right door. I went in and played for a while- I think it was "Rock Me Baby" and "Key to the Highway" until the woman auditioning me yelled for her partner to come in the room. 'Listen to this' she said, nodding at me, in my braces and pointy glasses. I was as surprised as they were when she handed me a contract." "Before I could read or write, I was transported by listening to my parents' 78s: Vera Hall's "Black Woman;" Blind Willie Johnson's "Dark Was the Night" and Leadbelly, who I used to try to sing like, much to my kindergarten teacher's dismay. I had no idea what or who I was listening to, but it stirred something in my soul that has been swirling ever since. In the Village I listened and played in the coffeehouses. There was Lightnin' Hopkins, Muddy Waters, Mississippi John Hurt, Dave Van Ronk, and the newcomers like my teacher, John Hammond Jr., Artie Traum, Geoff Muldaur, Danny Kalb and so many others picking up from the source. 1973 found me on stage at the Philadelphia Folk Festival singing with Maria Muldaur and immersing myself in all the styles that made up the 'folk revival,' which of course is a continuum, a river of astonishing richness and deep beauty. "As I tour from my home base in Woodstock NY, I am always inspired by the beauty of the people and places around me. I have come to understand that the power of music comes from sharing, not just performing. The connection among people that can be created with music is what keeps me going."